Email engagement company ActivePath will soon broaden the scope of how it transforms customer engagement. That’s because the New York-based company has been acquired by Broadridge Financial Solutions, a communications, technology, and data analytics firm. The terms of the deal were not disclosed. Founded in 2007, ActivePath originally offered its flagship ActiveMail solution but created a more robust email banking offering after merging with PowerInbox in late 2012. The company allows banks, brokers, and other billers to quickly compose and send website-like, interactive experiences via emails created using HTML. Under the new agreement with Broadridge, ActivePath will offer omni-channel capabilities including SMS, social, audio UI, chatbots, and personal cloud solutions. In the press release, President of Broadridge Customer Communications, Doug DeSchutter commented on how the company would benefit from bringing on ActivePath. “In ActivePath, we gain a founding management team with rich entrepreneurial experience and a proven track record of innovation, and we are delighted they are joining the Broadridge family,” DeSchutter said. Broadridge began as the brokerage services division of ADP in 1962 and became independent in 2007. The company is headquartered in New York and employs approximately 10,000 people in 16 countries. 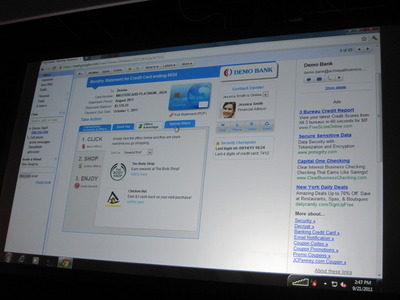 ActivePath debuted ActiveMail at FinovateFall 2010. Before today’s acquisition, the company had raised $13.3 million. Avi Weiss is CEO. Competitors in the interactive e-mail space have now become companions as ActivePath announced its merger with former rival PowerInbox early this week. The combined entity, which will be called “PowerInbox” also announced $10 million in new funding from Atlas Ventures and Longworth Partners, as well as from Battery Ventures, Genesis, GIMV and Correlation Ventures. While PowerInbox’s strength has been in the consumer market, ActivePath has made inroads into the enterprise space. The new company will feature ActivePath CEO Jeff Kupietzky as the new chief executive officer. PowerInbox co-founder, Dileep Thazhmon will serve as COO. 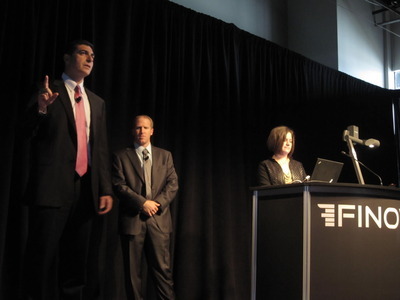 To learn more about ActivePath, please see the company’s most recent demos at Finovate Fall 2011 here and Finovate Fall 2010 here. Interactive Investor purchases DCisions, closes InvestorBee service. Finextra reports Rabobank Australia and NZ selects ThreatMetrix to secure online channels. InComm & SkyMall Ventures partner to launch electronic gift card program. Opus Research report recognises ValidSoft as leader in voice biometrics. AloStar Bank of Commerce chooses Andera’s oFlows for online account opening. TIO adds mobile bill pay app to its suite of services for El Paso Electric. Radian Mortgage Insurance now available through Mortgagebot’s loan origination system. Xconomy examines how Giftly will disrupt traditional gift card market. Luup signs partnership with Arab Link, provider of money transfer and exchange services in Abu Dhabi. Personal Capital launches Android app. Crunched lists On Deck in top 25 startups to work for. TechCrunch reports Holvi Plans To Disrupt Traditional Bank Accounts With Simple But Powerful Services. Citi Innovation Lab and SapientNitro honored at National Infocomm Awards in Singapore for next-generation banking experience. Experian expands debt-collection product suite with TrueTrace. DeviceFidelity launches moneto prepaid MasterCard. BlinkMobile announces five more councils to adopt BlinkForms. Klarna earns 2012 Entrepreneur of the Year award from European Tech Tour Association. Money Smart Life reviews Betterment and Kapitall. American Banker reports Betterment deepens finance advice features. Fiserv launches mobile app for debit and credit card rewards program. TIO Networks signs deal with MAPCO Express to deploy bill pay kiosks across Tennessee. Wipit enables e-commerce websites to accept cash payments. ActivePath’s ActiveMail reaches major milestone with 500,000 downloads. SaveUp raises $5 million, voices usage stats. Prosper launches web app for Apple and Android Mobile devices. ActivePath appoints former President & CEO at Oversee.net, Jeff Kupietzky, as CEO. Investment News recommends advisors introduce HelloWallet to their clients. miiCard partners with consumer data company Callcredit. Bank Technology News lists ActivePath, Cardlytics, and PayPal as 3 of the top 10 tech companies to watch. mFoundry powers First Hawaiian Bank’s m-banking. The Houston Chronicle examines how Dwolla helps consumers give money to friends & family without exchanging cash. Mixergy interviews Matt Fellowes, CEO of HelloWallet, to discover how it went from 0 to 300K subscribers in 5 months. Plastyc receives over $1.2 mil in new funding from undisclosed investor. Acculynk forms International Internet PIN Acceptance Consortium with major e-commerce merchants. Taulia’s billFLO to continue service beyond December 1 shutdown date. Continuity Control doubles 3rd quarter revenue, partners with BancVue. PeerTransfer partners with Tuition Management Systems. MasterCard invests in mFoundry to bring PayPass to mobile phones. Dwolla now free for transactions under $10. Fox Business News interviews SmartCredit.com’s John Ulzheimer. TechCrunch reports PayPal’s cyber Monday mobile payment volume is up over 500% from last year. PayPal now integrated into Red Laser App. Bank Technology News profiles ActivePath. Samurai from FeeFighters is now incorporated into Shopify in beta. eRollover.com changes its name to FIPath.com. Discover placed on 2011 InformationWeek 500 list that honors America’s most innovative users of business technology. Bank Technology News profiles Cardlytics. E*Trade to use Mitek’s remote check deposit technology. Silicon India Startup lists SimpliFI as a tech tool to track investments.